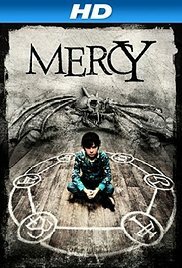 “Mercy” is based on a short story by Stephen King (original titled “Gramma“). In the past they made a series of movies out of Stephen Kings stories, with varying success. “Christine“, “Carrie“, “Misery” and “Pet Sematary” are all gems and timeless classics. And of course “The Shawshank Redemption” is a masterpiece. I wasn’t so thrilled about “Cujo” and “Firestarter“, both in book form as the eponymous film. And I’m waiting for “Cell” impatiently (even though John Cusack plays a leading role). After I’ve read that “Mercy” was based on a story by King, I had to check if it was any good. And once again it shows that a short story is never a good basis for a feature film. The reason why it resulted in a short story, is just because there isn’t enough material to turn it into a long story. The result is a miserable slow film with not much to see in it. And to be honest, I didn’t understand in the end what it actually was about anyway. Judging from the opening scene, I expected a rather good film. The brutal, “in-your-face” beginning, with an ax striking devastatingly, left little to the imagination. Bloody images aren’t directly shown. You’ll only see a play of shadows. This was already an indication that you’ll be spared from gore, gruesome images. This doesn’t mean this is really necessary for such movies, because (for me) the best horror is where you also need to use your imagination a bit. This is also the strength of the literary work of Stephen King. The imagination and the underlying anxiety. Unfortunately, I needed a lot of imagination to make a horror out of it and there was hardly a sign of subcutaneous anxiety or tension. It was obvious that it’s a sort of Machiavellian tale with someone selling her soul to a demonic entity to achieve certain goals. Only the demon wasn’t convincingly elaborated. For once I liked the extraordinary performances. And that for a horror story. Shirley Knight plays an excellent part as the creepy grandmother Mercy and equals effortlessly the scary Annie Wilkes in “Misery.” Chandler Riggs plays the loner, who had a special bond with his grandmother, in a convincing way. Even Dylan McDermott as the handsome neighbor (or acquaintance) wasn’t so bad (contrary to what he did in “Freezer“). The only letdown was the appearance of the demonic entity Hastur with his “led lamp”-like eyes. This looked so pitifully bad. Even a haunted house at the fair has more frightening things. Despite the onset being full of suspense, the end result is still abysmal. “Mercy” won’t frighten you or give you nightmares. In addition most scenes are much too dark, making it difficult to follow. And understanding the story alone is a problem anyway. I’m still wondering what Hastur was! As a short story it’s probably a successful concept (and it’s from King ultimately), but as a film it failed in all areas.